Jim Luecke has spent years diving in locations around the world from the pristine waters of the Caribbean to home in the Hawaiian Islands. 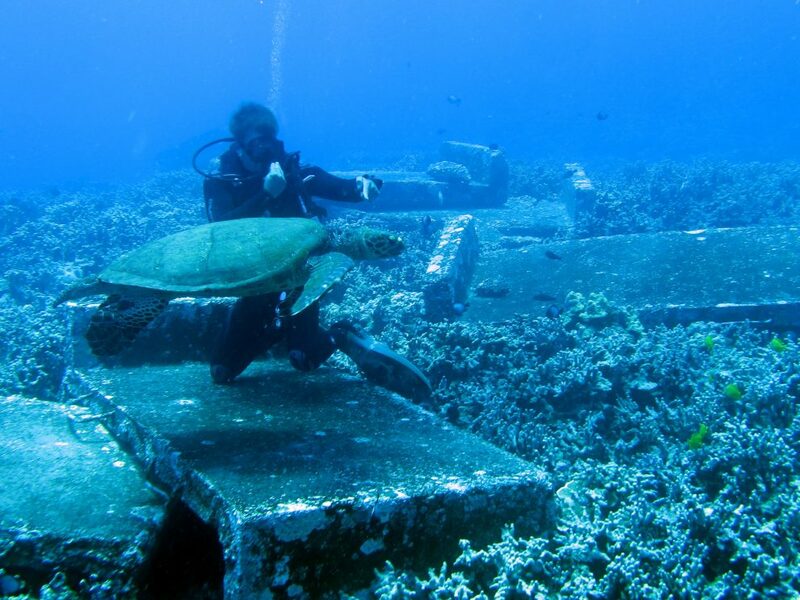 Serving as the Assistant Curator at Maui Ocean Center, he is very familiar with Hawaii’s marine life. Nevertheless, a recent dive off Maui’s southern coast proved even “professionals” can experience an unexpected thrill – it was his first wild encounter with the rare and critically-endangered hawksbill sea turtle. A long hawksbill approaches Jim Luecke during a dive off Maui’s southern coast. While green sea turtles have captured the hearts of millions in Hawaii, the hawksbill tells a more somber tale. It was not long ago that both species were on the brink of collapse before receiving federal and state-level protection as an endangered species in 1978. Following decades of statewide conservation efforts, the National Oceanic and Atmospheric Administration (NOAA) estimates the green sea turtle population is increasing with a growth of 53% over the last 25 years, but the road to recovery for the hawksbill turtle has proven to be an uphill battle. To identify a hawksbill, look for a sharp beak and four scute plates between its eyes. Known as ‘ea or honu‘ea in Hawaiian, hawksbills are smaller than green sea turtles and are distinguished by their bird-like beak. A small number of hawksbills are residents of Maui and Molokai while the majority of hawksbill nesting takes place on the Big Island. It is estimated that only 20-25 hawksbill females nest each year, a number dwarfed by the 500-800 nesting green sea turtles. While it’s natural to question why we see fewer hawksbills than green sea turtles despite years of protection, it is not a fair comparison to make. The overall hawksbill population is significantly less than green sea turtles, making it unrealistic to compare the results of conservation efforts between the two species. Green sea turtles are also more likely to be seen due to their nearshore foraging habitats, whereas hawksbills primarily feed on sponges that can grow in deeper waters. Historically, hawksbills were harvested for their prized shells that were used to make jewelry and furniture inlays. Loss of nesting habitat, predation, entanglement with marine debris, and other pressures have reduced hawksbill populations worldwide to critically low levels. Climate change has also altered the coral reefs they depend on for sea sponges. It does not help that they face a slow growth-rate and an estimated 20-30 years to reach sexual maturity. Skippy Hau (Hawaii’s DLNR Division of Aquatic Resources) measures a hawksbill hatchling. 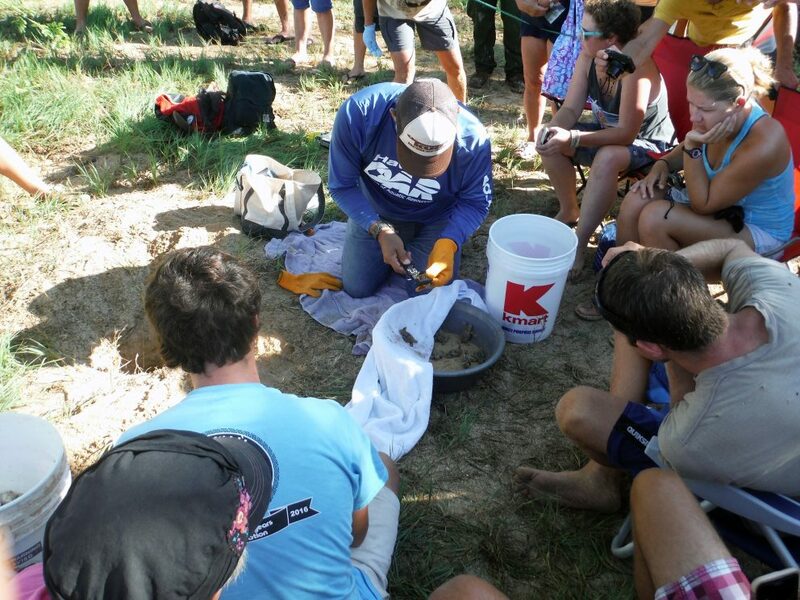 Volunteers and non-profit organizations work together to protect, monitor, and study sea turtle nests. But there is a silver-lining to this story. Hawaii is home to a collaborating network of government agencies, researchers, volunteers, and non-profit organizations. More of Maui’s residents and visitors are becoming aware of their impacts on the environment and local wildlife. Lead by federal and state agencies that monitor, study, and protect Hawaii’s sea turtles, one can be optimistic about the future of Hawaii’s hawksbills. A recent addition to Maui’s conservation groups is the Maui Ocean Center Marine Institute (MOCMI), a non-profit organization with a mission to rescue, rehabilitate, and release endangered Hawaiian sea turtles. In 2017, MOCMI established a collaborative agreement with NOAA National Marine Fisheries Service to oversee the South Maui Turtle Stranding Network. With donated space from Maui Ocean Center, MOCMI will eventually have a center to help injured turtles under the guidance of NOAA and the U.S. Fish and Wildlife Service. A Hawaiian green sea turtle undergoes a routine checkup at Maui Ocean Center. Every effort counts and you can make a difference! Report any hawksbill sightings or turtles in distress to the MOCMI Sea Turtle Stranding Hotline at (808) 286-2549 (South Maui) or (808) 286-2899 for all other areas. If you see illegal or suspicious activity that could harm a sea turtle, contact DOCARE at (808) 643-3567 or NOAA OLE at 1-800-853-1964. To become a MOCMI volunteer, visit mocmarineinstitute.org/support. Written by Evan Pascual, Marketing & Public Relations Coordinator. “Ka Mo‘olelo Moana,” or “The Ocean Story,” is a monthly column written by Maui Ocean Center and published in The Maui News.